Timely immunization of premature infants is important for protection of these vulnerable children from vaccine-preventable diseases. In this large multicenter study of nearly 14 000 extremely low-birth-weight infants in neonatal intensive care units, DeMeo and colleagues examine the need for subsequent sepsis evaluations and increased need for respiratory support following immunization. The risk of sepsis evaluations increased 3.7-fold and the need for increased respiratory support doubled. The accompanying editorial by Kuzniewicz and Klein discusses the need for criteria to distinguish signs of sepsis from expected events after immunization. Violence against children continues to grow as a salient issue in national and international public health and public policy discussions. Finkelhor and colleagues report on the National Survey of Children’s Exposure to Violence conducted in 2013-2014 for children aged 0 to 17 years. In total, 37.3% of youth experienced a physical assault in the study year, and 9.3% of youth experienced an assault-related injury. These findings highlight the importance to physicians of inquiring about exposures to violence and being prepared to help patients and families concerning possible needs for protection and counseling. 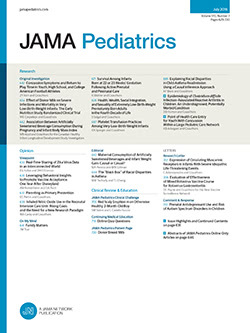 Despite its inferior diagnostic performance, ultrasonography is now preferred to computed tomography in the evaluation of children for appendicitis owing to concerns about ionizing radiation exposure. Bachur et al study 52 153 children with appendicitis treated in 35 pediatric institutions from 2010 to 2013. Use of ultrasonography increased 46% and use of computed tomography decreased 48%, with a decline in the proportion of negative appendectomy from 4.7% to 3.6% and no change in the perforation rate. The editorial by Richards and colleagues discusses the implications of these findings for the reduction in the use of ionizing radiation in other diagnostic evaluations. Increasing attention is being paid to using ultrasonography as a way of avoiding ionizing radiation associated with x-rays. Brat and colleagues examine the diagnostic accuracy of a neonatal-adapted lung ultrasonography score to evaluate oxygenation and predict the need for surfactant in 130 neonates with respiratory distress. The score predicted the need for surfactant, with an area under the curve of 0.93 for preterm babies younger than 34 weeks’ gestation, and correlated well with oxygenation. The study demonstrates the potential of ultrasonography for use in neonates.